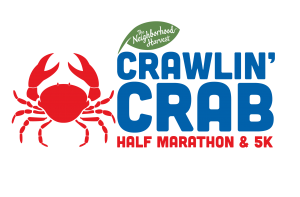 Want to join in on the fun of the Crawlin’ Crab Half Marathon, but not feeling up to running the whole 13.1 miles? Grab a friend and join us for the Half Marathon Relay! You will split the distance of the same Crawlin’ Crab Half Marathon course to complete it as a relay team. Each participant will receive all of the great swag including a tech shirt, finisher medal, surprise finisher item, and entry into the post-race party with four free beers (ages 21 and up) and soup. Buses will be staged near the start line prior to the race start to transport the Leg 2 runner to the exchange zone. Buses will also bring Leg 1 runners back to the finish line once they are done running. Learn more about the Crawlin’ Crab Half Marathon Relay course HERE. Awards will be given to the fastest men’s, women’s and co-ed teams (1st, 2nd, and 3rd).